Running on Block Island, RI. 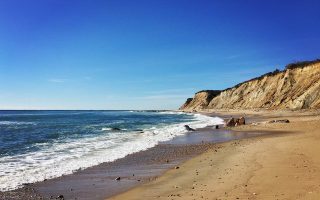 Best places to run on Block Island. Block Island is a tiny of island off the coast of the tiny state of Rhode Island, but it packs in all the rustic charm and seaside beauty that we’ve come to expect from the Outer Lands region of Southern New England, making it a popular destination for summertime tourists. The island is only about three miles wide by seven miles long, but with 25% of the land preserved preservation and 30 miles of trails, there are great running options, from scenic trails and sandy beaches, to inland farms and coastal lighthouses. The best places to run on Block Island are along Mohegan Trail, Corn Neck Rd. to the North Lighthouse, Clay Head, and Crescent Beach. We’ve also designed a nearly 10-mile ‘Block Island Tour’ which incorporates some of the highlights of the southern and interior sections of the island. 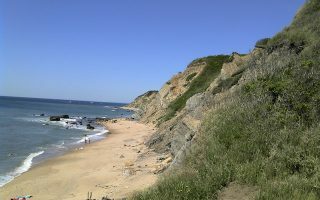 The beaches on Block Island can be great for running — at the right times and at low tide, the sand is firm and compact. 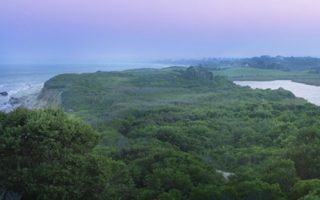 Our Block Island running routes cover the breadth of the island’s scenery and variety. The island’s small size means that several of our routes overlap or can be joined together for a longer run. 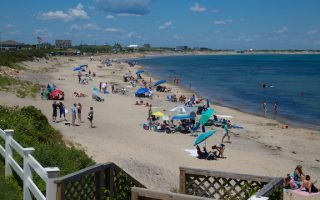 Locals say downtown (officially called New Shoreham) can “get a little crazy” with tourists, especially in summer, but in general the roads are wide and safe enough to enjoy a run on any part of the island. Block Island is an hour-long ferry ride from Point Judith, RI. Reservations are required for cars. There are also ferries from Newport, Fall River, MA, and Montauk, NY. Once on island, taxis are convenient and relatively cheap, and biking is a very popular way to get around. A wonderful run from downtown to one of Block Island's most popular spots, with great views of the water. A good add-on is to take the steep stairs down to the beach, and run/walk for a bit along the beach. 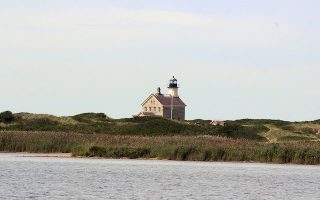 Iconic Block Island views, including the Great Salt Pond, Sachem Pond, and Grove Point, and a seaside trail to the North Lighthouse. 9.4 miles out and back from downtown. 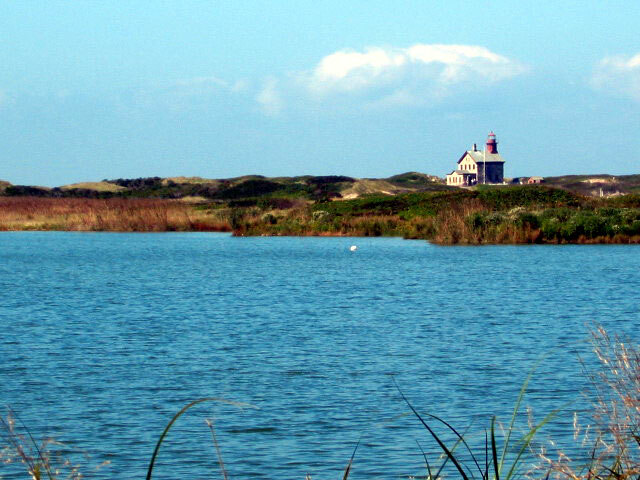 Good shorter option is section from the Wildlife Refuge to the Lighthouse. This stretch of sand on the eastern shore of Block Island is always flat and firm at low tide, making it an ideal beach run that can cover up to four miles. A run in the the trail network of the Rodman’s Hollow shrublands, then along a lovely dirt road leading to Black Rock Point. Running on Black Rock Beach is also great, especially at low tide. Clay Head is widely regarded as one of the most scenic locations on the East Coast, and it's "maze" is one of the most beautiful places you will ever get lost. Then main trail is 2.3 miles, but add some in the maze. Route of a popular 10k race run in the spring that has it all: stonewall lined dirt roads, rolling farmland, ocean views, and “The Wall -- an invigorating climb at mile four. This route follows the course of the popular 15K road race, providing endless views of farmland and a look at the lesser traveled inland of the island. Rolling meadows, stone walls, sparkling ponds, towering cliffs. The loop is done twice for the race. Block Island weather is typical of the southern New England coast in summer. Average high temperatures in July are around 80F (26C). The ocean keeps things cooler. Fall is gorgeous, with mild temperatures and less humidity. Due to the ocean influence, spring can take a little longer to get going. Winters are moderated by the ocean’s proximity, so there is less snow and extreme cold than inland parts of New England, though the weather can certainly be damp and stormy. Block Island has a range of accommodations, with many spots clustered around the small ‘downtown’. Inns and B&Bs dot the rest of the island. No matter where you stay on Block Island, a pleasant run will be out your doorstep! 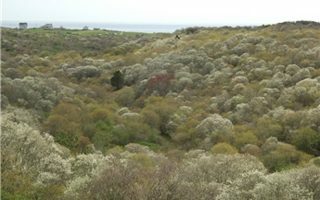 The Block Island Tourism Council is the go to for information on places to stay blockislandinfo.com. Block Island Sports Shop is the main sporting good store on Block Island, with gear for runners. Also, lots of information on recreation on the island. You can also check Meetup for local running parties. 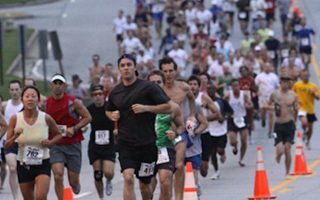 The Run around the Block, Shad Bloom 10K, Run Beach Run 5K are all popular races.